Over New Years, ‘C’ and I decided that we wanted to get out of Mexico City for a while and have a bit of a holiday (needless to say my life at the moment is a constant holiday, but ‘C’ works damn hard and needed a break!). We decided we would drive down to the city of Oaxaca (don’t be fooled by the spelling, as its pronounced more along the lines of Wah-hak-ah) as its meant to be one of Mexico’s most interesting cities. 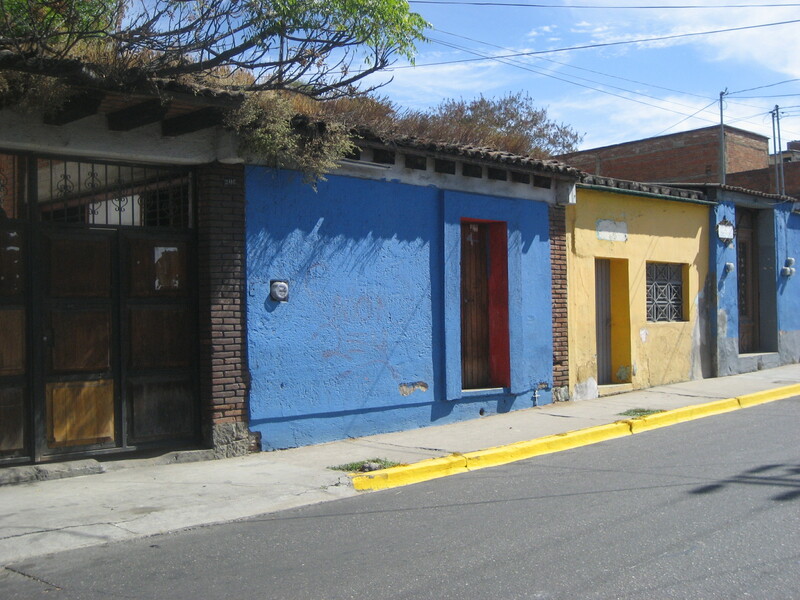 Oaxaca is the 5th largest state in Mexico and is located in the south. 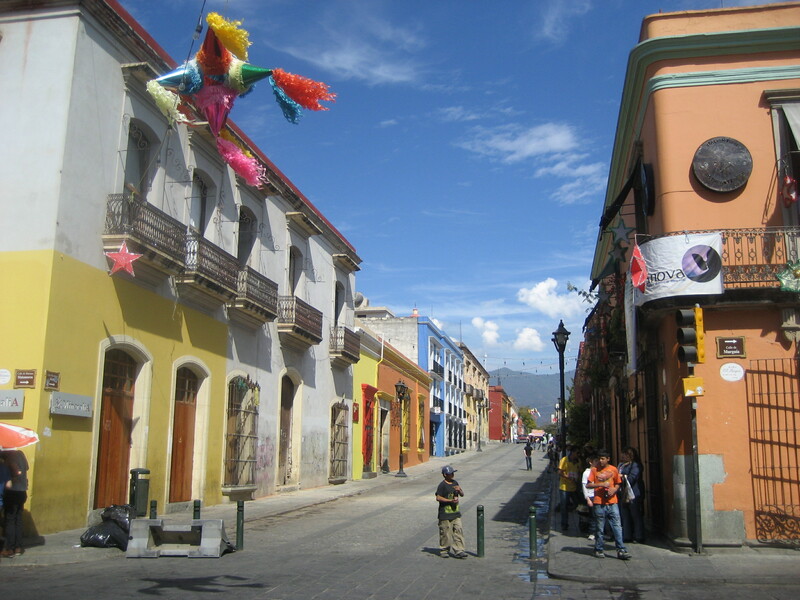 The state is named after its largest city Oaxaca Juarez and is best known for its indigenous people, culture, art and artefacts. There are over 15 different cultures within the state of Oaxaca but the most proliferate are the Zapotecs and the Mixtecs. Throughout Mexico many of these cultures have been diluted over time and by modernisation, yet the indigenous people of Oaxaca have managed to maintain a very resolute cultural identity, due to the most part of the state’s rugged and isolating terrain. 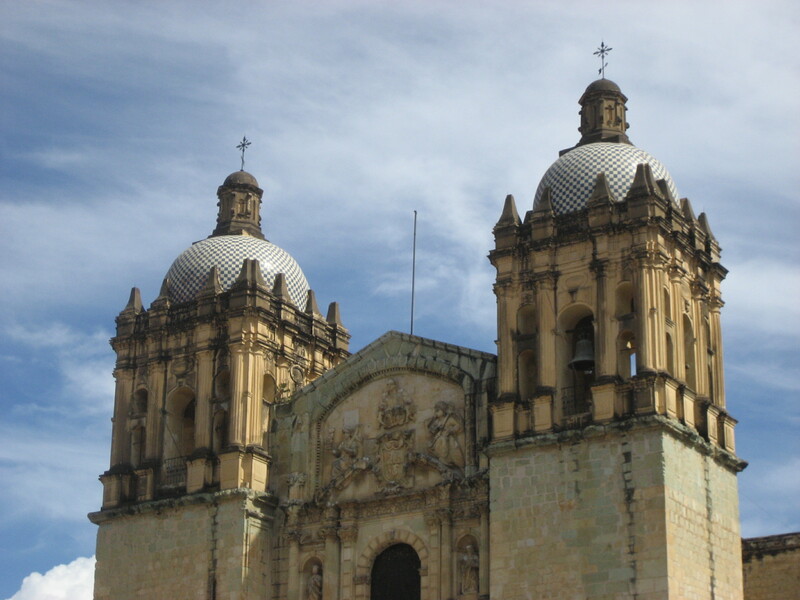 However Oaxaca it is one of the poorest states in the country, and what I understand they rely heavily on tourism. Some friends of ours decided that they wanted to join us on our trip too, so the four of us set off on our little adventure very early on a Wednesday morning. The drive down from Mexico City is roughly 6 hours, however this all depends on the traffic. Although it can be quite a long journey, it really is a beautiful drive as you wind through the hills and valleys, go though small towns and past farmers working the field – its 100 years away from the maddening crowd of Mexico City. It is a drive that keeps you constantly on your toes, as you are forced to dodge speeding cars and trucks overtaking on sharp bends, on hills crests, or even the odd person or two deciding to cross the highway right in front of you. Yet, the conditions of the roads are generally quite good and as mentioned the scenery is breath taking and is well worth the drive. On the way down we stopped off at the little town of Teotitlan. We had been driving for about 3 hours and we were all getting a bit peckish and needed a stretch. So we aimed for the Zocolo (the main square) and picked a little restaurant that was full of happy looking Mexicans enjoying their morning meal (the universal sign of good food!). 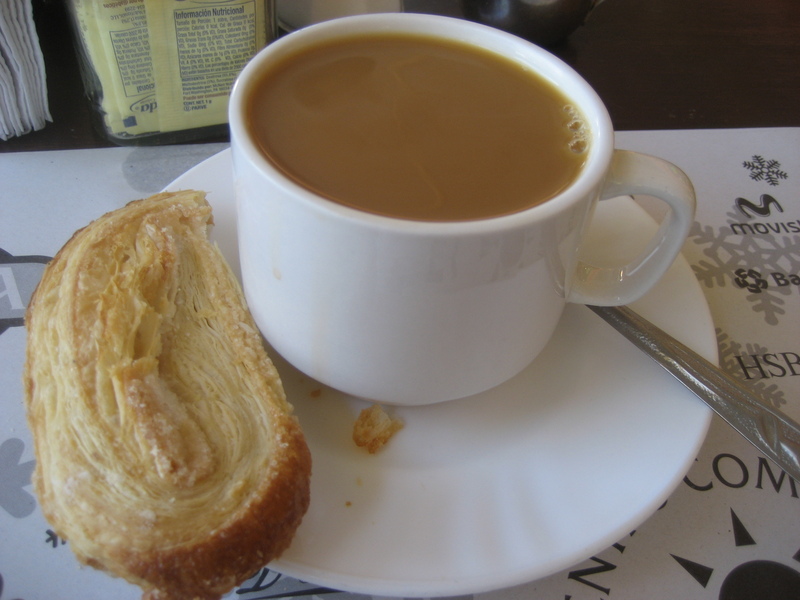 The restaurant was called Doña Gloria which served hearty Mexican breakfasts, together with surprisingly good coffee. The service was friendly and efficient, and the food satisfying – it really was just what we needed to break up the long drive. 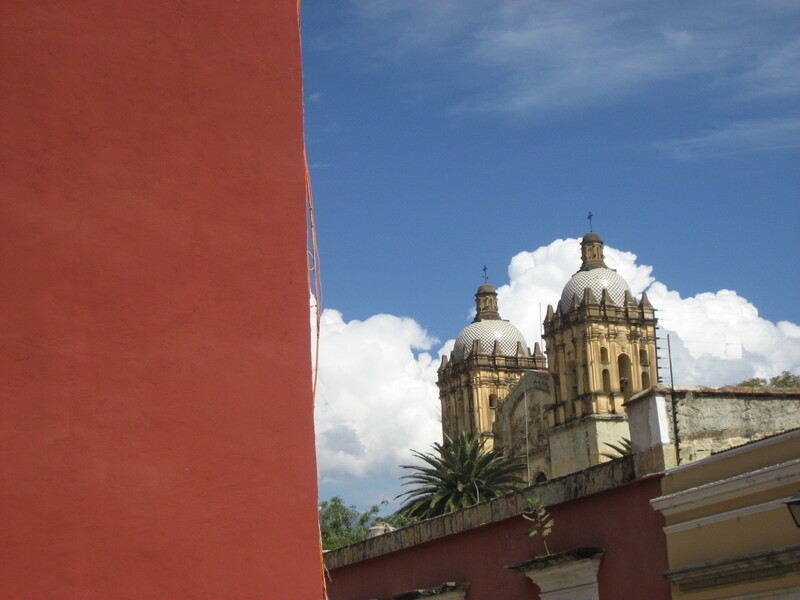 We finally made it to Oaxaca around 3pm and what a beautiful city it is! Stunning colonial architecture, magnificent churches and cathedrals, quaint cobbled streets and to top it all off – very warm people. 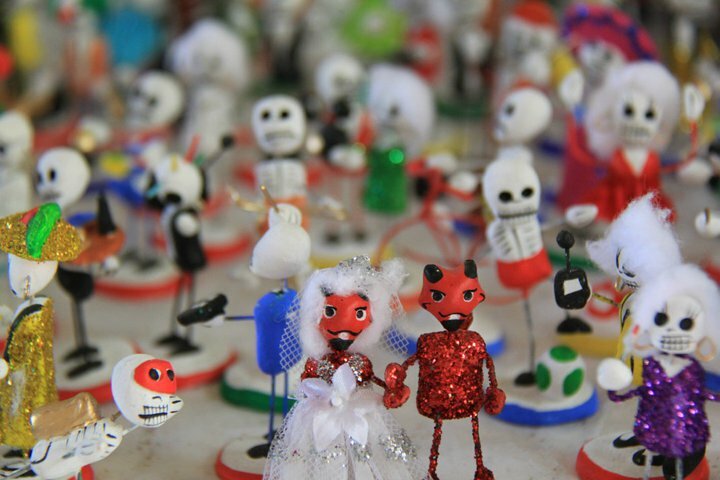 As mentioned previously, Oaxaca has a very vibrant indigenous population who are also very well known for making and producing artefacts such as; wood carvings, rug weaving, paintings, embrodory and pottery to name but a few. 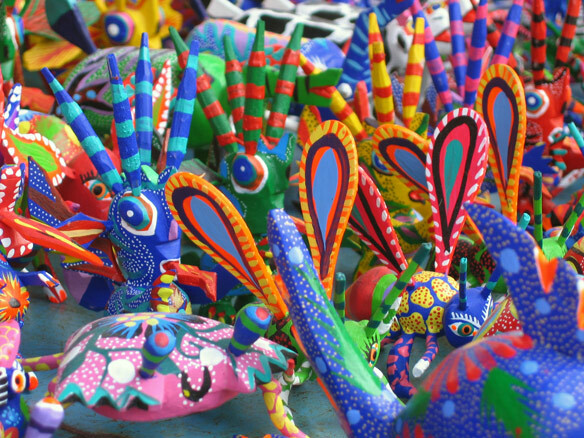 Surrounding the city there are numerous villages specialising in each type of folk art that you can drive to, and not only buy the artefacts straight from the artisans – but truly get a taste of Mexico. 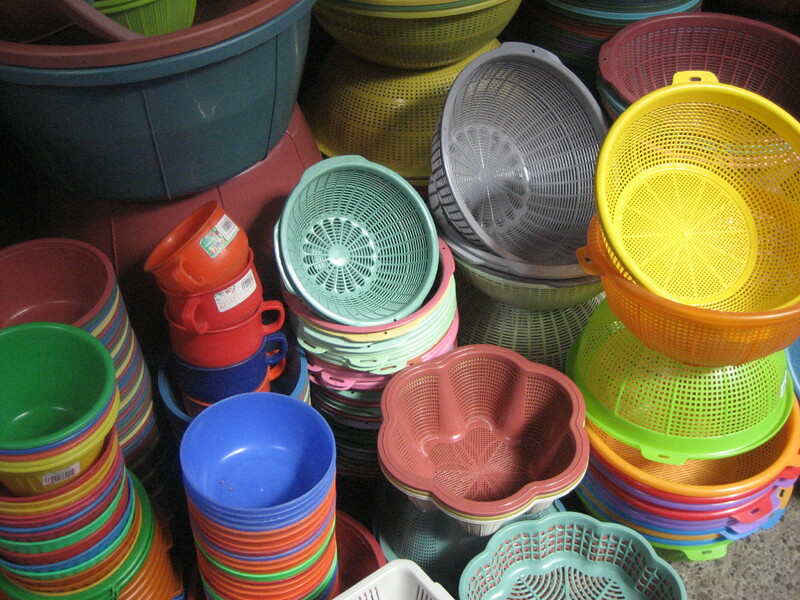 If you are unable to drive to the villages, you can get everything in Oaxaca, which has numerous markets and stores to satisfy you purchasing appetite. Now, having said that, I didn’t buy a thing!! I was slightly disappointed as I really wanted to get something for our apartment like a rug or painting that would remind us of our trip, and we could slowly fill our very sparse flat with. As much as I love the vibrant colours of Mexico, and can appreciate the colourful and interesting wood carvings or the story that the painting tells, I just have not found anything that relates to me or that I would want in my home. For me the colours would be too garish, the art slightly too abstract and the wood carvings slightly too childish to display. On the other hand if we lived in a beautiful old hacienda in the country side, that would be a totally different matter all together. One of the best memories I have from our trip, and something I would recommend everyone to do is to go to one of the numerous markets that the villages hold on different days. 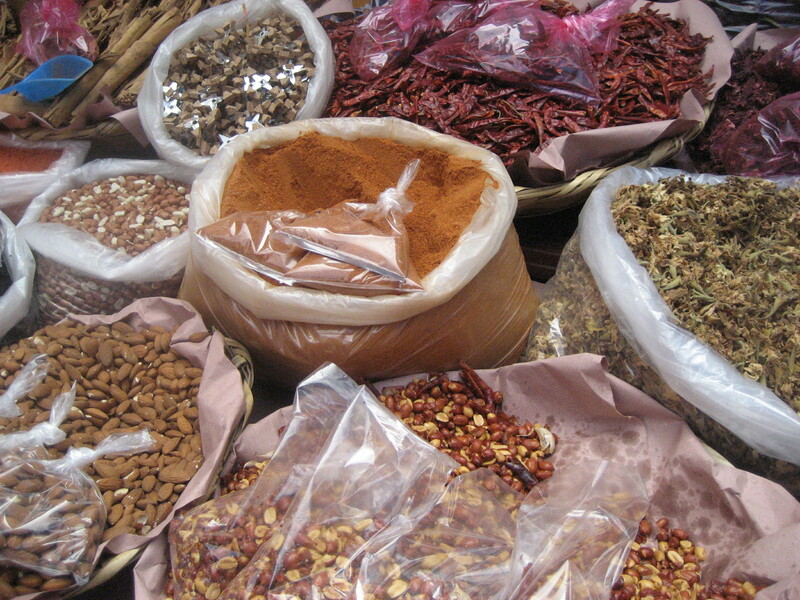 For me markets are always a hive of activity and is where the real flavour of a country or city or village lies. Although archeological sights impress me, it really is the ‘now’ that inspires me. Roaming around any market, you are not only in the heart of that community but you are also given a glimpse into the everyday lives of the people surrounding you. 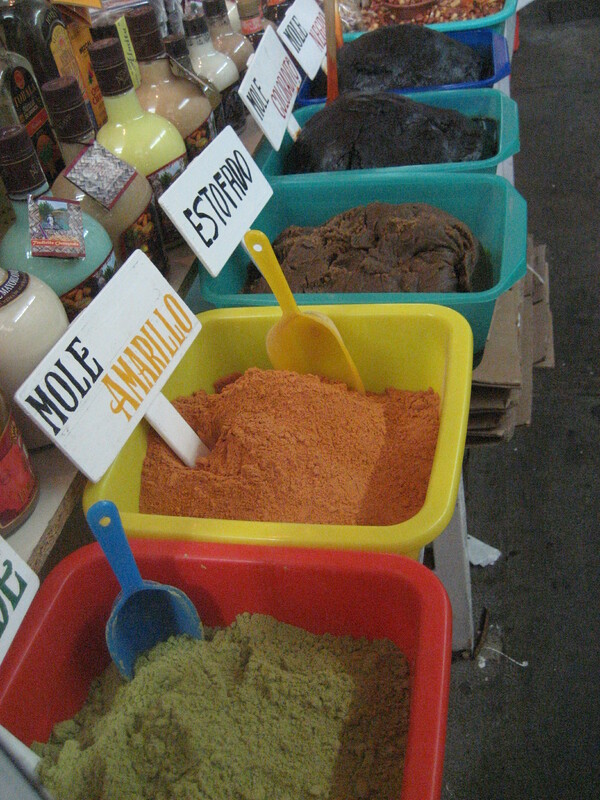 ﻿﻿﻿﻿﻿﻿﻿﻿We drove to the village of Zaachila where there was not only a large general market, but also the weekly animal market. 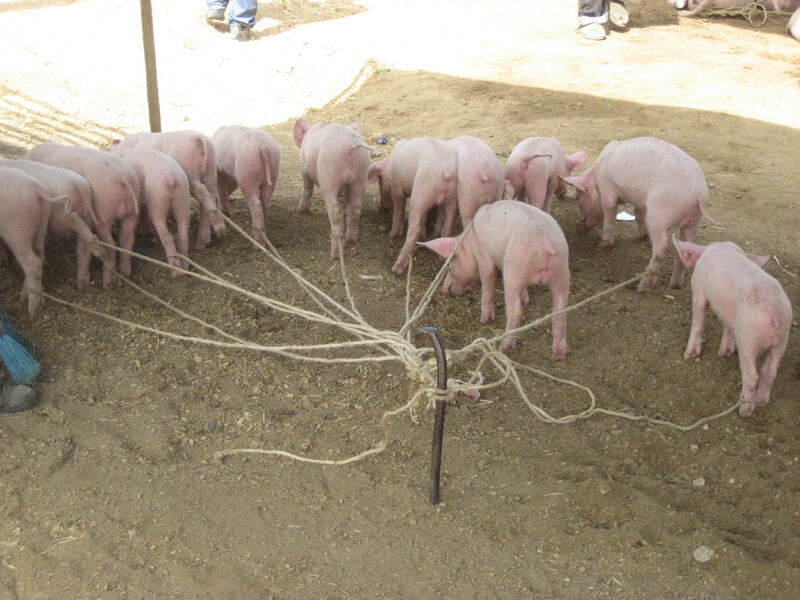 The animal market is a scene that is becoming increasingly rare as the world become more regulated (and in my opinion sterile), and it will become increasingly more difficult for people to buy live animals, opposed to pre packaged meat at a grocery store. At this market, every farmer from the nearby villages had brought in their best livestock – be it chickens, turkeys, pigs, goats, horses, cows or donkeys – and were discussing, bartering or arguing with eachother for the best price over their valued possessions. Experienced women scrutinising piglets to ensure that they pick a healthy little chap that will be able to feed their family in a few months time, men inspecting oxen to help them work the earth – such a close relationship between man and animal tends to be lost in the world I live in, but is one that should be appreciated. We spent a lot of time driving to the different villages, strolling around the streets of Oaxaca and taking long leisurely lunches (just how a holiday should be!). 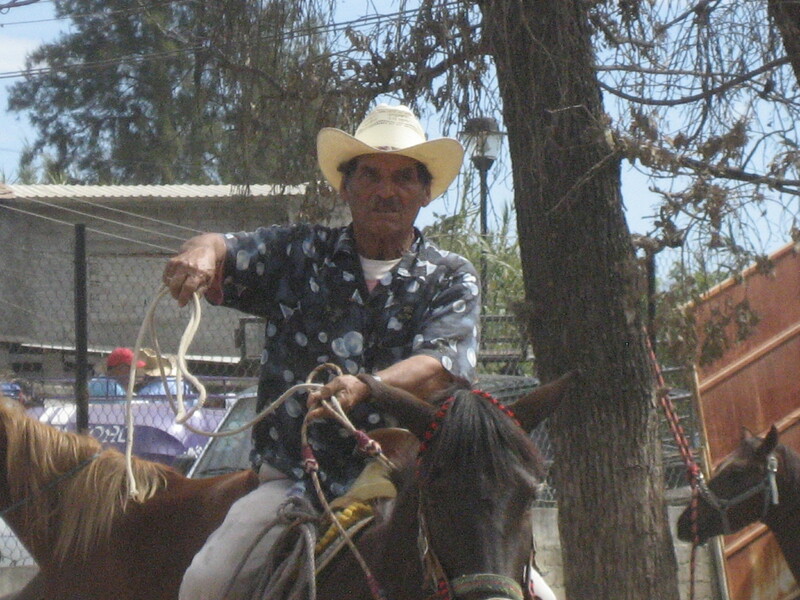 However, when I return to Oaxaca, I really want to go into the surrounding hills and go hiking or go horseback riding as it is meant to be incredibly beautiful. unfortunately we didn’t have time this time around, but you have to always leave something for you to do when your return – and we will definitely return.